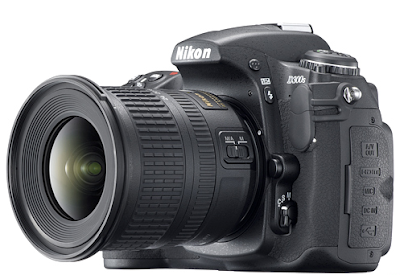 The Nikon D90 as your first digital single lens reflex camera...and D300s as the successor...and the D3100 as a fun backup! Nikon D90 Lab New Platform! Citing the lack of group-centric features on Blogspot, plus lack of rating functionalities and most importantly - stability and speed, the decision to move forward to a more advanced community-focused blog has been reviewed and acted upon today. BTW, categories is still down. Please click on the new site to pick up where this site left off. ALL 592 articles to-date has been successfully migrated there! See ya there. Welcome to the Nikon D90 Lab evolution!! 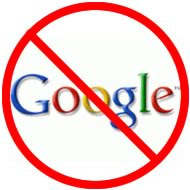 Google Advertisement Quality & Site Stability Deteriorating Fast! Firstly, all my posts now no longer allows me to attach an image (no matter which browser I used). Secondly, all my formating went all hay wired! Thirdly, I can no longer label any of my articles! I may have to seriously considering a switch if this continues. Moreover, the advertisement on this blog gets weirder and weirder by the days that I simply no longer wish to feature any more advertisement on my blog. A good 80% of those ads I see are not even vaguely related to a camera! 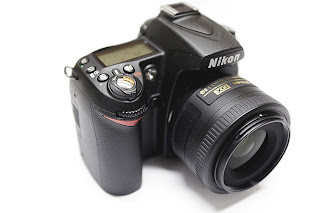 The last time round, I have taken down Google advertisement as quite a few of their featured sites are actually bogus web merchants selling a lie of getting a Nikon D90 for $350! O well, so much for a free blog site! Serves me right. So, with Singapore's National Day round the corner, the frequency of rehearsal increases around the island. And if you are lucky, you will witness some of the most advanced combat aircraft and choppers doing low-pass display of the Singapore flag. Here, I witness the Apache choppers with an extremely old Chinook (sorry for Google's problem). It is said by some that we actually bought this twin-blade, accident-prone chopper off the Americans at a dollar each after the Vietnam war era, together with some M113 Armored Personnel Carrier! Well, that's a saying which is still circulating among every military personnel today. Nikon Camera is Now A Projector? Until I hear more about this, this sure is ground-breaking news, yet weirdest one from Nikon! Where do they actually get their inspiration? So, the next time you wish to show off those images you shot, you jolly well find a white wall first before having the ability to project your pride and joy. In addition, due to the power consumption of this out-of-the-box feature, don't expect any battery decent enough to do over a hundred shot before rushing to the wall power points. 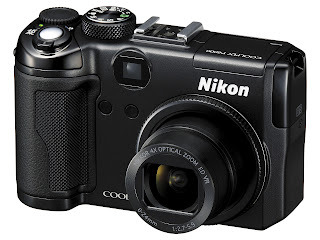 No Nikon Coolpix P7000 after all...so sad. All in a month's work of fun in shooting! I want to take this opportunity to thank all of you for spending your precious time to drop by and read this blog. Your valuable comments are all that really matters to me. Likewise, the friendship of seeing your world via the followers section. I would also like to thank the steadily increasing fellow enthusiasts following this blog. It sure makes my day and keeps me motivated to shoot more and share with all, the life, culture, and lifestyle of Asia, while spending time to review and use the best optical system to relate these stories. Do visit my other lab site - Nikon D300s Lab, that I can relate to the getting-serious amateurs who may wish to improve their skills and deepen their passion in photography. For me, I am just hoping to get serious too, so the process of getting there is half the fun already. Remember, fun is the key! Its only about two months away, and we are beginning to see some spectacular news of this upcoming race. The six time champion veteran, Michael Schumacher has decided to make a sudden come back. And out of a sudden, we have a whole bunch of artists like Backstreet boys and Chaka Khan joining in the fray. My tickets has long been booked in June 2009 and I am just gathering what need to be ready to shoot this race, amateur style of course. Maybe, I'd get lucky and get a few winning shots maybe. Well, that's not all the most important but rather, to experiencing the rowdy atmosphere of a real race. This AF method is most prevalent in digital SLR cameras. It requires dedicated hardware (line and cross-type autofocus sensors) which can increase the overall cost of a camera. Phase detection AF still uses contrast to assess where to focus, but contrast just isn't used as iteratively or throughout the image...only at the autofocus sensors. A disadvantage with the phase detection method is that it requires pre-calibration, and can therefore always misfocus if incorrectly calibrated. 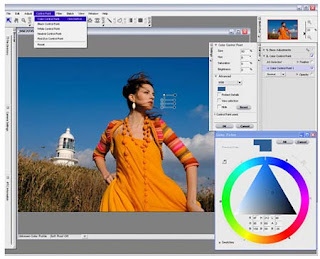 This AF method is most prevalent in compact cameras and newer SLR cameras with Live View. This is because these cameras can be made less expensive by using the sensor itself to perform autofocus, with the (relatively) cheaper processing power used to determine maximal contrast. A disadvantage to contrast AF is that it cannot gauge whether the camera lens is front or back focused-- just that it is out of focus. This is primarily why it has to be used iteratively; contrast measurements at at least two lens positions are needed to assess which direction the camera should be focusing (ie, in front or in back of where it was previously focusing). The contrast detection is generally more fail proof (if given lots of light and enough time to focus) since it not reliant on pre-calibration. All of us has been busily shooting with the view finder that one hardly bothered to explore the Live View option of the Nikon D90! Shooting with the minute view finder for macro or odd-angled shots can sometime prove too challenging for me, and I am beginning to accept the use of the big but slow focusing live view. Just yesterday while shooting macro shots, I discovered that you can actually use to "+" button on the back of the camera to zoom in on the point of focus! (maybe not that new to some of you) And with the gorgeous live view screen, I can see exactly how the subject is being properly focused. No more eye-pooping strain on the eye, many less defocused shots! Wait! We Almost Forgot About 4th August 2009! Hey! There's still another press conference tomorrow by Nikon! 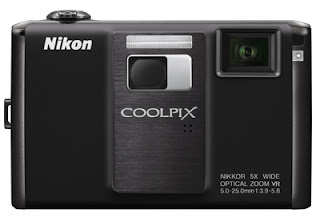 Fingers cross, I hope Nikon will finally announce the Nikon Coolpix P7000!! Frankly, my objective analysis confirms the Nikon Coolpix P6000 is still far from her nearest competition and much more has to be done to appease the gods of prosumer compacts. Maybe, tomorrow is the day where we can all bath ourselves in that waterfall of advanced compacts from Nikon. There are just times when you want to remain inconspicuous when shooting, may it be in a museum or some sites where carrying a DSLR would only invite security personnel to approach you. And that's when a smaller competent camera would fit ideally. But being one who has grown accustomed to the quality of shots produced by DSLR, its something I would have to live with, if such a camera is in my possession. Some say they only do decent shots with ISO 400 and below, and the amount of chroma noise just stays there even in an uncompressed RAW shot. This evening was such a setting where I simply do not wish to carry the Nikon D90 into a dinner location filled with thousands of people to celebrate the National Day rally. O well, I lost a few good shots with the featured fifty limited edition Harley Davidson bikes tonight that I thought could be featured on this blog. Maybe, I should just go get one...and am seriously waiting for a Nikon P7000. In the teething months of each boy, we will often begin to see the corners of our home furniture chipped, books being mutilated with saliva and bite marks, toys been nibbled off, crayons been halved etc. And when those targets are not readily available, they will conveniently turn their small teeth on their own hands and clothes! Here, we have Devon munching on his own sweater. So, with the F1 fever gaining momentum on the island, more of these models are on display on retail fronts. A few caught my eyes yesterday while exiting a giant electronic mall and the Lensbaby Muse was quickly used to dispatch them. Aperture 2.8 was used. Full manual. 1/50 second, ISO set at 200. Hmm...convincing enough to upgrade? Maybe, perhaps, will think about it? 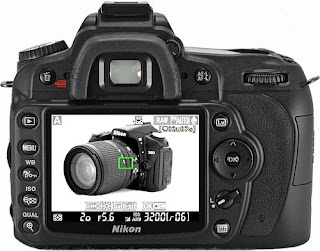 But, yes, the image quality will still be identical to the Nikon D300 and Nikon D90! In a phrase - Blown away twice, off my chair and down the stairs! Sticking to my conviction that software such as Aperture 2 and Nikon Capture NX 2 should serve only as an insurance policy in photography, a claim was finally made today by my dad to salvage his photo gallery off his recent Brazilian trip on a Nokia N78. No big deal. About a hundred images. Now, if you are familiar with Adobe Lightroom, or Photoshop and the likes, we are naturally talking about a rather steep learning curve to just cover the very basics. But with Nikon Capture NX 2, I was happily enhancing his first image in a few minutes!! The U-point technology is really that intelligent and intuitive like the brochure claims. I was shocked at how easy it is turning out to be to turn overexposed, "dead" camera phone images into restored professional images, ready for A4 printing. Mind you, I never bothered even exploring Nikon Capture NX 2 after I acquired it, save a default installation on my laptop. I think this is my second time running this program this morning! Now, this is what I call professional post processing standards for idiots. Anyone can perform the work in minutes, compared to hours/days required by other equivalent software products. At least, I can now say that the Nikon Capture NX 2 win Apple Aperture 2 by miles in ease of use! It's been almost a week (only) since I began playing with manual focusing, and I am beginning to realize one key advantage of shooting manual - faster response time to capture what you really want, without the need to wait for AF to do her job first. Of course, the downside is a constant need to adjust ISO and shutter speed but my first full manual lens - Lensbaby Muse, seems to answer that call pretty well! The fast and loose tilt/pull/push concept is really silky smooth and quick! To increase my chance of a take-home image with the Muse, I now shoot exclusively at 4.5 FPS JPEGs. The double glass optics option of the Muse gives user a higher taken down rate of decent tilt-biased images. The ability to focus fast and loose is what I like best about this model. 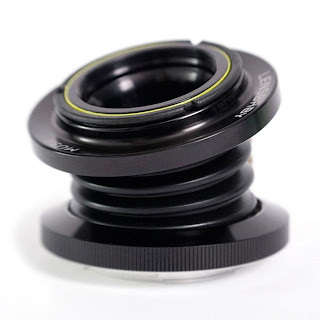 You basically tilt, pull or push the extensible lens barrel to get sharp focus on your subject. And of course, everything is manual. So, don't drive it like an automatic transmission automobile. Now, the lens comes with four aperture discs, from F/2.8 to F/8. And the loading of these interchangeable discs ultimately determine the aperture you will shoot your Lensbaby with. Whatever makes you happy, you can go get the telephoto kit or wide-angle kit to bring the 50mm focal length wider or narrower. New Definition of Fun - Lensbaby Muse! Yup, you heard me. Fun is one of the key ingredient to fuel your passion in photography. 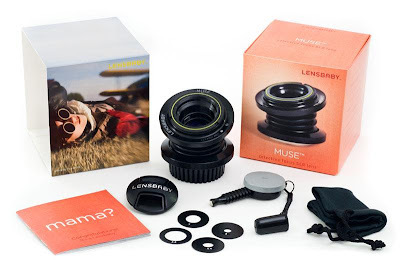 And what better way to fuel it than to get the Lensbaby Muse Glass Optics! It was seriously for fun that I got this lens this week, and the selection process was quite straight forward. The muse option is the cheapest entry point. Both the Composer and Control Freak has a higher price point, hence taking some fun out of the whole equation. Moreover, all lensbaby optical characteristics are identical. But of course, within the Muse comes two flavors - plastic or glass optics. My initial test soon concluded that the plastic option are just too soft for the liking. Not a single point is sharp! I would say the glass option is a good start point for most. At $150, you can't really go wrong with it. As the statistics show, I cannot agree with you more, that the Nikkor 35mm F/1.8G forms the most coveted lens in every DX camera owners' mind. It's a wonderful, sharp lens, with much resolving power to spare, and of course a very modest price tag. In fact, I got mine the day it was launched! It's low light performance negate the dire need to carry your strobe around, and her prime lens characteristics simply rocks. O yes, did I mention the lightning fast focusing strength? Most of us who handled the lens was pleasantly surprised how fast and quiet the focusing is. So, if you are still hesitating on purchasing one, you should stop whatever you are doing and go get one. From where I am, stock are flowing in and I can begin to see proper stocks everywhere. ALL MATERIAL ON nikon d90 lab IS ©2008-2010 nikond90lab.blogspot.COM. PHOTOGRAPHS ON THE SITE ARE COPYRIGHT materials of VARIOUS CREATORS.